Studying The Long-Term Effects Of Traumatic Brain Injury On Veterans More veterans from Iraq and Afghanistan are surviving with traumatic brain injury. In Boston, the Department of Veterans Affairs is studying the long-term effects of those injuries on 800 veterans. Army veteran Chris Riga survived multiple blast injuries in deployments in Afghanistan and Iraq. He rearranges sticky notes on his desk to assist him in remembering tasks he has to do throughout the day at his job as patient experience coordinator at the Northampton VA Medical Center in Leeds, Mass. The Department of Veterans Affairs is conducting the most comprehensive study to date of blast injuries on post-Sept. 11 veterans. Improved battlefield medical care in Iraq and Afghanistan means more troops have survived with traumatic brain injury, or TBI. Researchers are trying to understand the long-term effects of those injuries. And 800 veterans from around the country have enrolled to find out what blast exposure has done to them. Former Army Ranger Chris Riga realized something wasn't right shortly after he had been exposed to several improvised explosive devices. "I couldn't keep my balance"
"The first time I noticed, we had been through multiple IED strikes within [the period of] a week ... in Afghanistan, and, unfortunately, I was at a memorial ceremony and I couldn't keep my balance after standing up for about two minutes," Riga says. We were always either preparing for combat or deployed in combat. Blasts and exposures were a daily incident. Riga served several tours in Afghanistan from 2001 to 2014, eventually commanding all U.S. Special Forces there. During his 29 years in the Army, he served as an Army Ranger in the 82nd Airborne Division as well as in the 3rd and 7th Special Forces Groups in Afghanistan, Africa and Iraq. "We were always either preparing for combat or deployed in combat," Riga says. "Blasts and exposures were a daily incident." Researchers are now looking at veterans with a variety of symptoms, such as PTSD, alcohol abuse, and sleep problems, which tend to co-occur with traumatic brain injuries. "We don't only look at the military service period," says Regina McGlinchey, one of the co-directors of the VA study. "We look at what happened to these people when they were younger, before they were in the military, so we capture things like rock wars and sledding incidences when they were growing up." The study's co-director, Bill Milberg, adds that they are also looking at sports injuries and bar fights. "The whole gamut," he says. They're trying to determine if pre-military history affects a person's risk of physical or psychological disorders as a result of military service. We're not trying to understand PTSD, or just TBI. It's like, what does war do to an entire person? And they're trying to understand the possible impact on a person's emotional well-being. "We're not trying to understand PTSD, or just TBI," McGlinchey says. "It's like, what does war do to an entire person?" Researchers found that exposure to blasts resulted in changes to brain function and brain structure. They also learned that veterans could have suffered a brain injury from blasts even if they never had a concussion. One of the researchers, Laura Grande, found the effects of blast exposure are the same even if a person had no symptoms of concussion. "It's not the PTSD that's driving this memory deficit," Grande says. "It's not the sleep deprivation. It's not the substance abuse. There is something about blast exposure that is also associated with memory impairment." Riga lives in western Massachusetts, where he works as a patient advocate at his local VA. A co-worker who works with a lot of recent special operations veterans told him about the VA study. At 54, Riga has had many concussions and has ongoing problems with short-term memory — so he volunteered. By participating in the VA research, he has been taught how to cope with his memory loss. 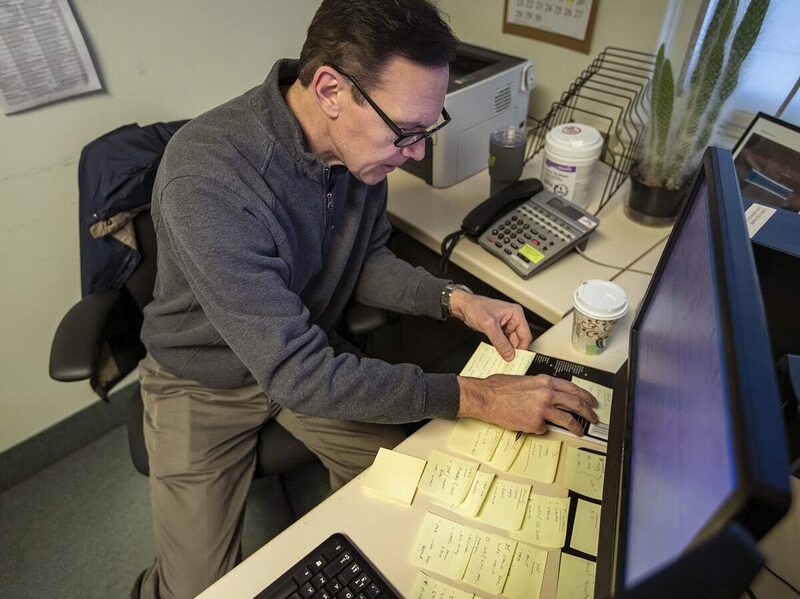 "I go through a lot of sticky [notes]," Riga says. "My wallet is full of them. It's a tool. Rather than not only forgetting something and adding the stress of worrying about forgetting something, you can just simply write it down." By working with Riga and other veterans, McGlinchey hopes the VA team can identify combinations of conditions that seem to predict poor outcome. "So that we can target who it is that are going to need a lot of care; intervene early enough where we can have an effect and have an impact on the rest of their lives rather than letting the horse keep running out of the barn," McGlinchey says. "But first, we have to know who to find, how to target. You can't just bring 3 million people ... who have been deployed in for help. We have to figure out who needs the help." McGlinchey and her colleagues are trying to identify those at greatest risk for later disability in order to target therapy and other interventions as early as possible. Veterans interested in participating in the study can contact study recruiter Wally Musto at 617-799-8617.